Dr. Michael Palis, Professor of Computer Science, (left) and Dr. Simeon Kotchoni, Assistant Professor of Biology, (right) speak with students who participated in the Center for Computational and Integrative Biology-Research Experience for Undergraduates program. The program is currently awaiting notice of renewal by the sponsor, but we will open the application for 2019 on Monday, April 9th for those interested in participating if the program is continued. All 10 accepted applicants receive full room and board plus a $5,000 stipend for the 10 week program. The Computational Biology Summer Program provides meaningful summer research experiences to 10 undergraduate students and combines experimental, theoretical, and computational approaches with a focus on the intersection of the mathematical, computational, and biological sciences. In addition to the research experience, students receive computational biology training, professional skills development, and enrichment sessions geared towards broadening their understanding of the application of and issues surrounding scientific research. Faculty and post-graduate mentors guide the research projects and advise students toward further study and career development. Introduce students interested in pursuing a science major to an integrated approach to research that incorporates the biological sciences, mathematics, computer science, chemistry, and physics. Provide students with tangible academic, professional, and personal skills. Provide students with insights as to the application of scientific research to global issues and societal needs. Foster a collaborative environment that encourages discovery and innovation. Expose students to areas of relevance related to scientific research and development such as ethical conduct of research, regulatory issues, technology transfer and licensing, entrepreneurship, venture finance, and quality assurance. Equip participants to decide whether they wish to further pursue computational biology and/or a career in scientific research. The central theme linking research projects will be the modeling of biological systems — ecological, physiological, and molecular. We will focus on individual research projects, each involving multi-departmental collaboration. In line with the spirit and mission of CCIB, all proposed research projects are designed in collaboration among faculty from different department and all include both experimental and computational components. This organization will allow the students to be exposed to both types of labs (experimental and computational) and especially to experience team science research. 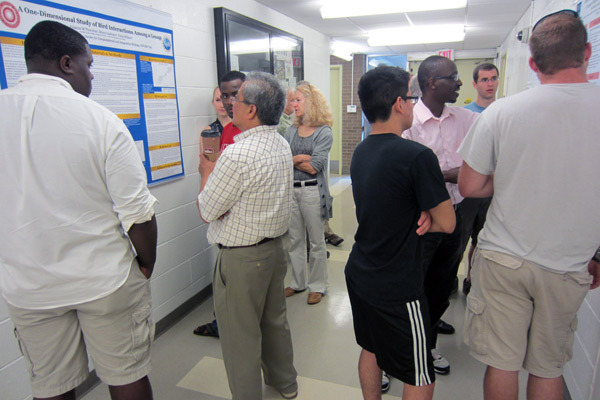 Each project will start from generally-stated scientific questions and faculty mentors will guide REU students to critically examining the question (providing them with foundational knowledge and skills as needed), formulating hypotheses, designing experiments, and interpreting results for the verification of the hypotheses and the formulation of valid alternatives when possible. The Computational Biology Summer Program accepts 10 students each year. Each student will receive room and board plus a $5,000 stipend. Application Deadline: Summer 2019 deadline is May 12th. * If you feel that you will not make the deadline please email Karen Taylor asking if an extension is possible. Veterans are particularly encouraged to apply. Students must submit a personal statement outlining their reasons for applying to the program. Two letters of academic reference must also be provided. Page last updated by Center for Computational and Integrative Biology at 2:29 pm April 8, 2019 . This page was printed from http://ccib.camden.rutgers.edu/programs/reu/ at 6:49 AM Monday, April 22, 2019.